Can I just write a love letter to ColourPop on Valentine's Day? Because this is turning into a real love affair. For so long, it was easy to avoid the brand due to them not shipping here and then having high shipping costs. Then, they started offering special shipping discounts here and there and so began the addiction. And even with the weak Canadian dollar, it still goes a long way. Even better if you use the $5 off coupon for signing up for emails, wait to order during a 20% sale, or order when shipping is free. As much as I love them, I need to cool my jets and this is part of what I think will be my last order for a while. I'll be sharing the other items in upcoming posts. 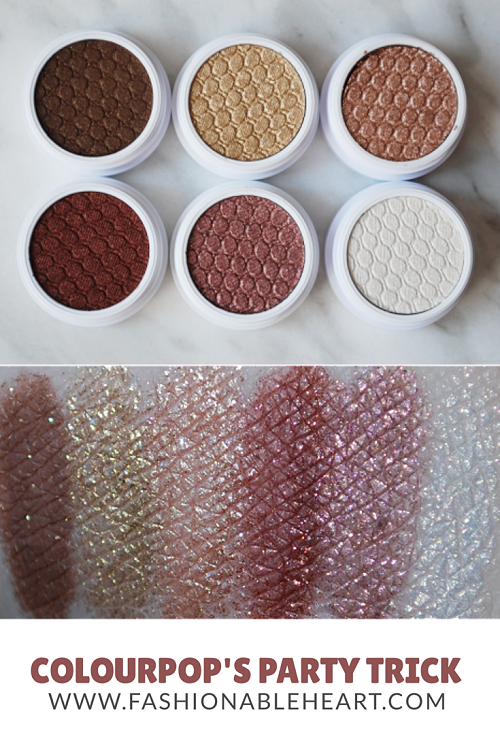 The Party Trick eyeshadow set is still available and you get 6 eyeshadows for $25 US. 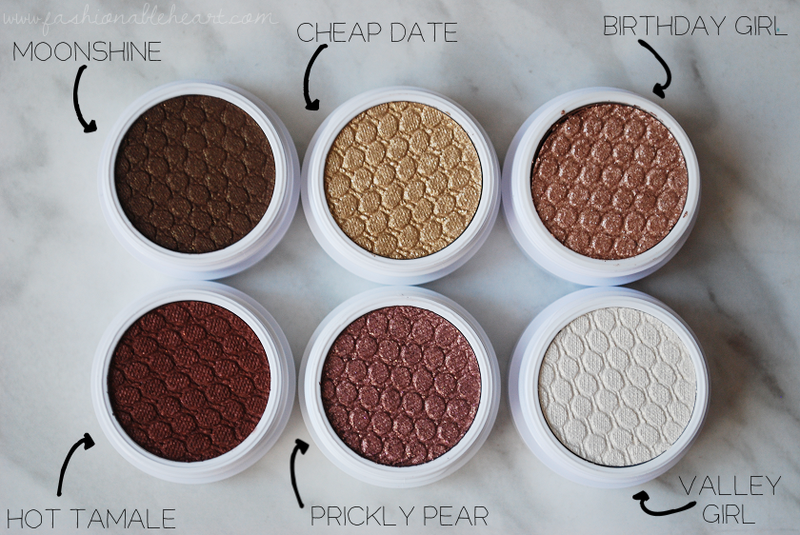 Considering one eyeshadow is $5 US, you're getting the sixth one for free. 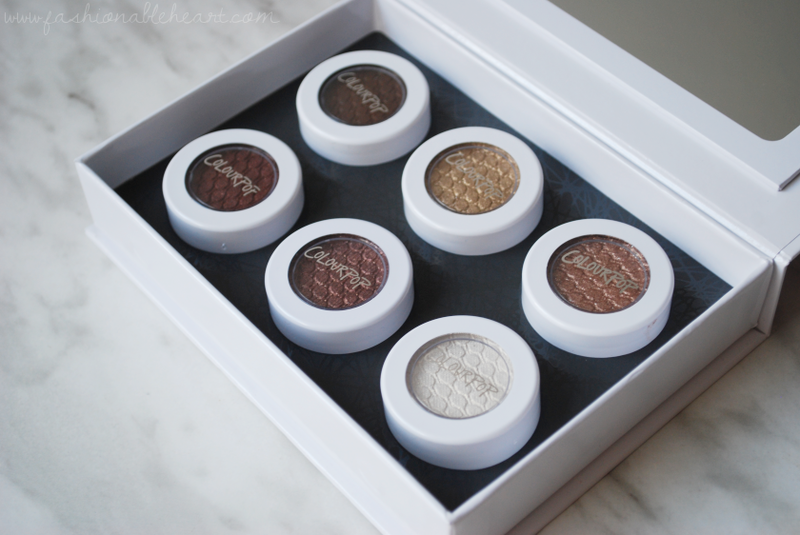 All of the shades in the kit are also available separately, but I've read that they are discontinued shades that they have only brought back for a limited time. I've already delved into the formula and what I like and don't like about it, so this post is just reviews and swatches of the actual shades. The kit comes in a sturdy cardboard material box with a mirrored and magnetized lid. At the moment, I do still have mine stored in it as it keeps them all together in my drawer until I get the organizers I want. 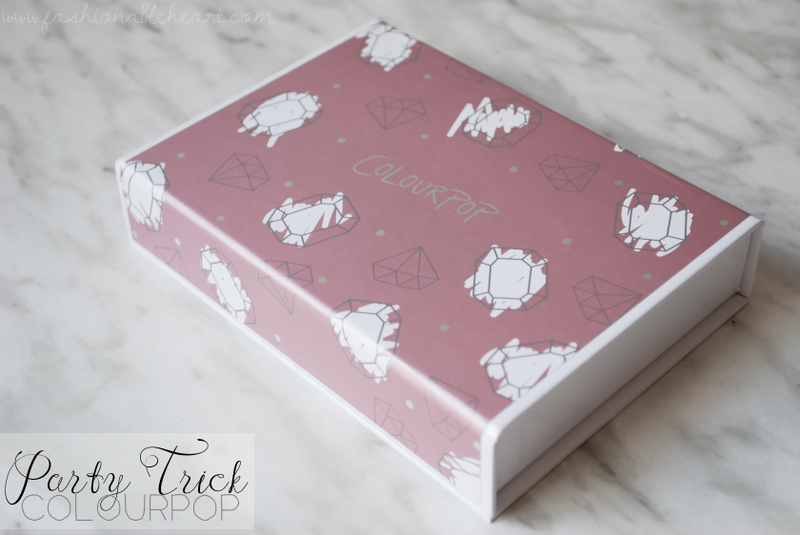 It's a fine box and cute enough to leave on your vanity if you wanted to. The foam around the eyeshadows holds them tightly in place, sometimes a little too tightly and I'm sitting there needing the jaws of life to remove one that has been pushed too far in. Just me? Wouldn't be surprised. Moonshine - Described as a metallic chocolate brown with gold glitter. It swatches smoothly and blends easily and the glitter is not overpowering. Beautiful for a brown smoky eye. Cheap Date - Described as a gold with silver sparkles. No, it's not sparkles. It's chunky glitter. At least mine is. I wouldn't say it is a new go-to, but it will be fun for sparkly party looks. Birthday Girl - Described as a light gold with silver and pink glitter. Definitely a champagne color. This type of shade is my jam, but this is also a little chunky with the glitter. I like it, but I don't love it. Hot Tamale - Described as a satin luxe coppery brown. Where have you been all of my life, you beautiful thing? At the top of my head, I can't think of any other shade in my collection that is similar. The standout shade of the kit, hands down. Prickly Pear - Described as a metallic lavender with gold and violet glitter. Why are purples so hard? It is so rare to find a total winner. This is okay, but it's not a must have for me. I love the shade swatched, it's gorgeous. When applied to the eyes, the purple really sheers out. I think it would look lovely layered over another purple or taupe, so maybe I'll try that. Valley Girl - Described as a pearlized vanilla with gold sheen. This is straight up white on me. It's too stark and glittery for a brow highlight (for my own personal preference). It's okay as an inner corner highlight. I haven't tried it as a cheek highlight, but maybe I'll have some luck with that. Or as a base for other eyeshadows. I'm determined to find a way to make it work for me. If you have it, let me know how you use it! Overall, I like these shades together in one kit. These look great on fair skin, but I've also seen them swatched on darker skin on their social media accounts and they look fabulous! For me, the real winners are Moonshine and Hot Tamale. If you love darker colors, I think these two would fit right in with your collection. I did not experience creasing with any of these and I would say they lasted around eight hours before starting to wear off. Let me know if you have this set or any of the colors in it and your thoughts! My experience with each shade may not be yours and that can be helpful for everyone to see.